The Shorecrest Guardian ad Litem Club is a new service club formed this year. Guardians ad Litem are court appointed adult volunteers whose mission is to ensure children in the foster care system have an advocate. Their only purpose is to ensure the child’s welfare is the most important consideration in all foster care decisions. 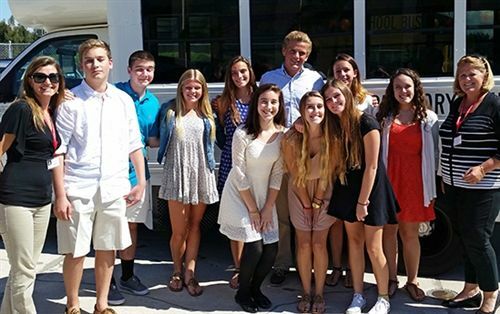 Shorecrest’s Guardian ad Litem Club’s mission is to provide assistance to Pinellas County’s Guardians. As part of getting the club off the ground, and to help its new members understand the difficult circumstances of foster children and the role of guardians, the club took a trip on October 20th to the Pinellas County Court House to observe several different kinds of proceedings in Family Court. While on that field trip, the club observed juvenile detention trials, judges making decisions on children’s removal from parental care, and case reviews of children already in foster care. In one case a father's children were ordered to be placed in the foster care system because the father was arrested for driving under the influence while his children were in the car. The day’s experience helped the Guardian ad Litem Club’s new members see first-hand the types of things that can go wrong in people's lives, and how innocent children end up suffering. These children are taken away from their parents for something that wasn't the child’s fault and put into a system where, to the child it seems as if no one cares about them. The Guardian becomes an incredibly important person in these situations, and are desperately needed to make sure foster children receive appropriate care and, most importantly, know that someone really does care deeply about them. With this in mind, the Guardian ad Litem Club members will work throughout the school year to support Guardians and their foster children. The Guardian ad Litem Club is open to all Upper School students; currently its membership is mostly freshman with a few sophomores. The Guardian ad Litem Club's next activity is organizing and participating in the Shorecrest Annual Holiday Gift Drive and everyone in the club is very excited to be a part of it.